You'll be £16.99 closer to your next £10.00 credit when you purchase 2,000 Years of Manchester. What's this? This is not a chronological history of Manchester with lists of facts and figures. Rather, it is an eclectic mix of fact, fiction, legend and myth which presents the history of Manchester from its beginnings as a Roman settlement, then as an insignificant market town, to its place as a city at the heart of the Industrial Revolution and beyond. The author has attempted to capture not only the often tragic lives, times, struggles and beliefs of the city’s ever-expanding population, but also its resilience and humour. Including photographs, illustrations, poems and quotes, the book ranges from the humorous, including the stories of “Spanking Roger” and the “Manchester Mummy” to the tragic stories of “Cholera” and “Mary Bradley”, together with the bizarre “Pig Tales” and the criminal “Scuttlers” and “Purrers”. This is a well-researched, well-written and, most importantly, entertaining and informative read, presented in an unusual yet accessible and easy-to-read format, intended to appeal to the widest audience. This is an excellent and fun book that conveys many of the stories and plenty of the history of Manchester. This is a history book that is actually fun to read! 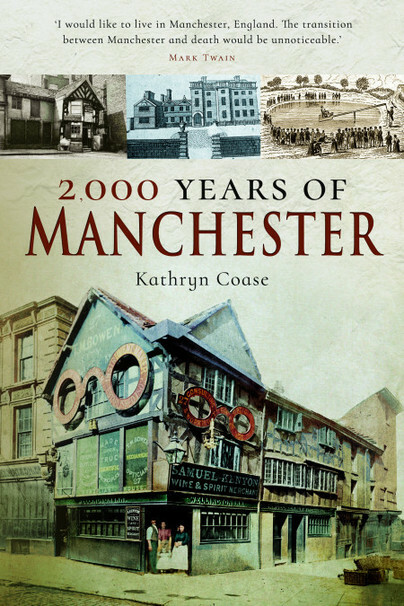 As a Mancunian, Kathryn Coase has been interested in the history of Manchester for many years and has possessed a longstanding ambition to research and write a book on the subject. After 30 years of teaching, she has finally decided to take some time out in order to fulfil this dream.